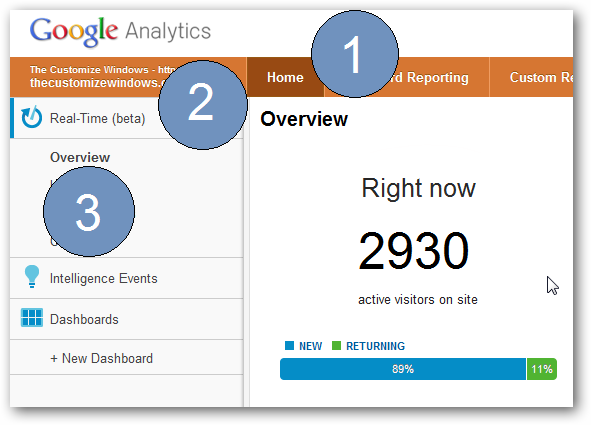 Website Stats With Real Time Visitor Analysis is possible using a feature of Google Analytics. Here is how to get website Stats With Real Time Visitor info. Previously we wrote about best WordPress Plugins for visitor statistics and several guides on Google Analytics. This time, we will guide you how to get Website Stats With Real Time Visitor Analysis using Google Analytics. You already know how to get the tracking code of Google Analytics. It will look like UA-26897703-1 ; you can use Google Analytics plugin . Simply copy paste the full code. If you already monitoring Website Stats with already installed code of Google Analytics, quite obviously you need not to do the above steps. The next steps of getting Website Stats With Real Time Visitor is universal for all. As you can see in the above screenshot, there are three numbers – these are the steps to click in order to obtain Website Stats With Real Time Visitor Analysis With Google Analytics. It will take few moments to gather the Website Stats With Real Time Visitor Analysis. If you scroll down the page, you will understand how powerful this system of getting Website Stats. There is list of most active pages, referrals and a great country map. Simply open your website in a browser window – the system will show your arrival by increasing the number and the marked area of map corresponding to your country will flick once. We have edited the real number in Website Stats With Real Time Visitor Analysis to four digits. Do not get frustrated with the Website Stats on the screenshot! In addition to other aspects of the design and format discussed ago, the font we use greatly influence to achieve an enjoyable read for the eyes of our visitors. Thank you very much Christy. Your appreciation means a lot to me. You do quite a hard work for your blog. There are various web based services (in fact Feedburner can do it) and plugins. Cite this article as: Abhishek Ghosh, "Website Stats With Real Time Visitor Analysis With Google Analytics," in The Customize Windows, March 5, 2012, April 24, 2019, https://thecustomizewindows.com/2012/03/website-stats-with-real-time-visitor-analysis-with-google-analytics/.